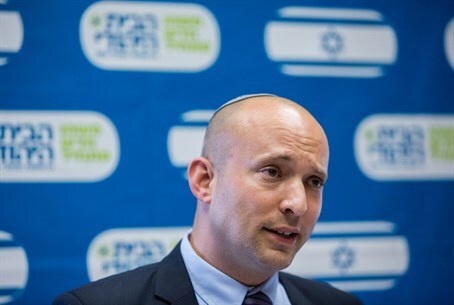 After two Jewish activists put under administrative arrest, Bennett says there must be equal punishment for Jewish and Arab terrorists. Jewish Home chairman Naftali Bennett announced his support on Sunday for the use of administrative detentions, house demolitions and the death penalty for Jews convicted of nationalist crimes. In an interview with Kalman Liebskind on Galei Israel, Bennett said: "I support the balance between individual rights and freedoms and the protection of Israeli's security and the prevention of these [terror] acts." "I said previously, and I stand behind, that it is right to use administrative detention sparingly, with great caution," the Education Minister added. Earlier Sunday, Jewish activists Meir Ettinger and Evyatar Slonim were placed under administrative detention, after having been arrested last week on charges of "Jewish extremist activity." Asked by Liebskind if he is in favor of equal punishments for Jewish and Arab terrorists - including home demolitions and the death penalty - Bennett answered in the affirmative. "If there is a trend [of Jewish terrorism], and again, we must put an asterisk on this because I haven't seen conclusive proof yet, but assuming there is a trend, than we must apply parallel measures." Continuing to press Bennett on the issue, Liebskind asked again if the Jewish Home chairman was including the death penalty as a potential punishment for Jewish terrorists. "Yes, of course," Bennett replied. "The answer is yes."